Worldpay delivered solid sales growth and expanding margins in its second quarterly report since combining with Vantiv. 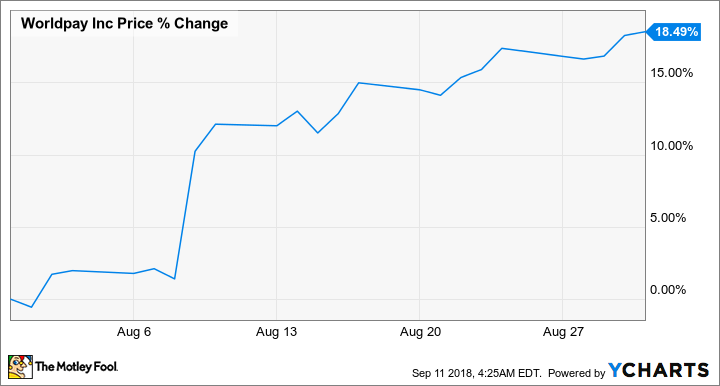 Shares of Worldpay, Inc. (NYSE:WP) climbed 18.5% in August, according to data provided by S&P Global Market Intelligence. The stock's gains came on the heels of its strong second-quarter earnings results and helped push the stock's year-to-date gains above 30%. The payment processing company published second-quarter earnings results on Aug. 9, with both sales and earnings for the period topping the market's expectations. Worldpay also raised its full-year guidance despite expectations for ongoing currency headwinds. On paper, sales for Worldpay's quarter ended in June soared roughly 91% to reach $1.01 billion and beat the average analyst estimate's call for sales of roughly $970 million. However, this picture overstates the growth picture because the comparable quarter in 2017 was prior to Worldpay's acquisition by Vantiv, Inc. -- another company in the payment processing space. Accounting for the combination of the two businesses, sales for the period were up 11% -- or 9% on a currency-adjusted basis. However, the company attributed about 1% of its quarterly sales increase to its acquisition of Paymetric. Worldpay's adjusted net income increased 25% year over year to $1.04, topping the average analyst estimate's call for per-share earnings of $0.95. Worldpay raised its full-year revenue target from between $3.81 billion and $3.90 billion to sales of between $3.88 million to $3.93 billion. The company is also seeing improving margins and now expects adjusted earnings per share to come in between $3.93 to $4 for 2018, up from its previous guidance for adjusted net income per share between $3.71 and $3.81. Hitting the midpoint of its new target would have the company on track to deliver roughly 18% annual earnings growth. Shares trade at roughly 24.5 times this year's expected earnings.